Sisters are the one with whom we spend our childhood. The time we spend with sisters is always memorable. Sisters have a bond that no one can break ever, no matter how far they are living. “Having a sister is like having a shining star in life“. If you have a sister as your “Best friend” in life you don’t need any other friend to hang out on weekends. 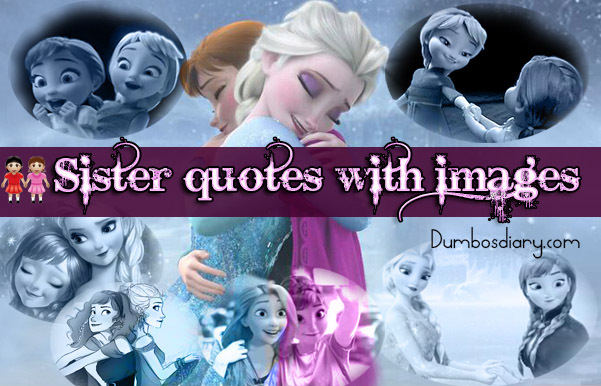 Here I’m sharing few sister quotes with images. You can download and share with your sister. Laughter is the symbol of happy life. We can get a life full of happiness if we have a sister as a best friend. A sister always tries to give happy life with no worries. A sister always values your opinion as not only a sister but a best friend as well. Having a sister is like having a best friend in the world. Doesn’t matter how many times you make her disappeared, she will appear again n again right beside you in troubles or happiness. An elder sister is a friend and defender. She always listens what our heart moaning. She’s a sharer of delights and sorrows too. An elder sister always performs double duty. On one side she fulfills the entire requirement one can ever have for friends. While on the other hand, she takes care you like a mother. A sister is truly a pearl to the heart and a friend to the life. She knits your thorny ways with a thread of love. If you have your sister’s hand to hold on life’s bridge, you can cross it easily. Sisters are best friends who always share laughter and wipe tears. Download these sister quotes and share with your sister. You can also share on social media as Facebook, Twitter, Facebook or Instagram. To have a sister in life means to have a best friend for life. She’s a best secret keeper and a reason to smile in sorrow. Only sisters and chocolates can make the life bearable. Sisters are the best friends who always share & multiply laughter and divide the pain & sorrow. Only your sister can make you smile or laugh when you don’t even feel like smiling. Sister is the one who is there for you when you can’t be there for yourself. Sisters are like diamonds that always glow, sparkle and twinkle in the dark hours of your life. My best friend, my sister is the only one who reminds me to fly when I have fallen down. Sister is your best friend that you don’t need to find in this selfish world. Having a sister in life is like having rays of the sunshine that brightens your darkest day. Sisters are like butterflies that lift you to your feet when someone tries to burn your wings. Tell your sister that “There’s no better friend than you I can ever have in my life. Doesn’t matter how much time has elapsed or how far we are living from each other”.